The most popular and oft-discussed feature of PlayerProfiler.com is the Best Comparable window. The Best Comparable Player for each quarterback, running back, wide receiver, and tight end is derived using an input-prioritized algorithm that sorts, dismisses, and ultimately matches each skill position player to his most similar counterpart at the NFL level (note: some player comps have recently retired). The group-and-match process starts by sorting players by body type: height and weight. This “body matching” immediately prevents ridiculous eye-test comps such as Odell Beckham is Julio Jones from being a possibility. Furthermore, it is the body match sequence that actually does most of the work. The human body and its infinity number of genetic variations combined with a small data set of NFL skill position players, renders close matches very rare. After matching on physique, we then group players by college production: (College Dominator Rate and Breakout Age) and athletic measurements (40-time, Burst Score, and Agility Score). Collegiate production is weighted more heavily than workout metrics, ensuring that Lamont Bryant could never be comparable to Calvin Johnson. The most interesting insight gleaned from this exercise was that the singularity of the athletes that we roster on our fantasy football teams. The vast permutations from just a handful of physical, athletic, and on-field productivity-related metrics on PlayerProfiler.com illustrated the true uniqueness most NFL athletes. Most is the key word. While no identical players exist, there are a handful of relatively close comparable in each draft class. 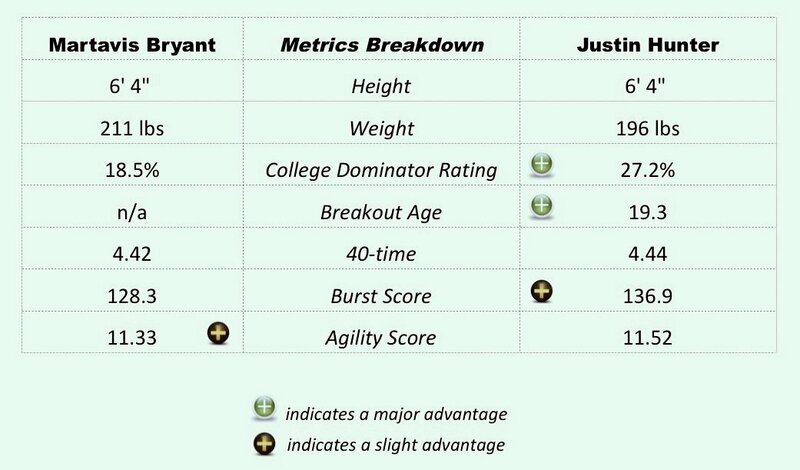 In reviewing the 2014 wide receiver class, for example, we found that the per-metric deviation of Martavis Bryant to Justin Hunter was small when compared to wide receivers like Jordan Matthews and Odell Beckham Jr., did not fall neatly into an existing archetype. Indeed, Greg Jennings is a relatively weak best comparable for Odell Beckham, which is particularly intriguing given that 5-11 wide receivers are relatively bountiful at the NFL level. OBJ is an incredibly unique athlete. The same can be said for Jordan Matthews and Jeff Janis. 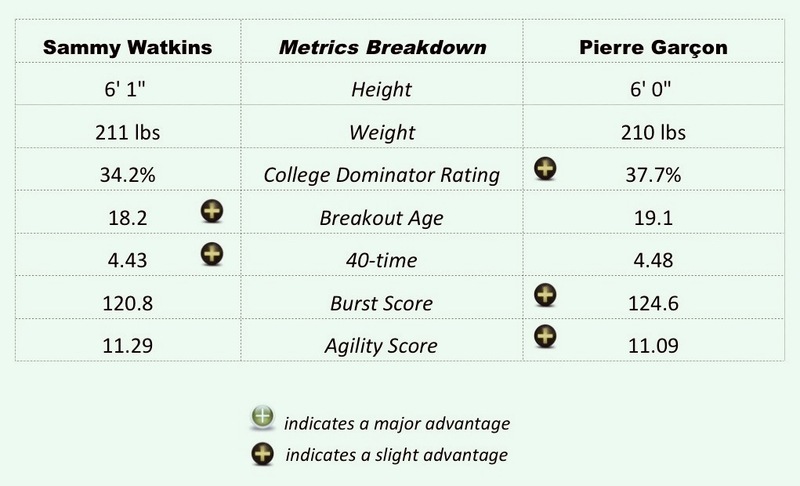 No NFL wide receiver possesses precisely comparable size and athletic measurable along with such a dominant college resumes — Matthews and Janis are truly special. When Allen Robinson entered the NFL, his comp to Dez Bryant became the close comparable in the PlayerProfiler.com database. 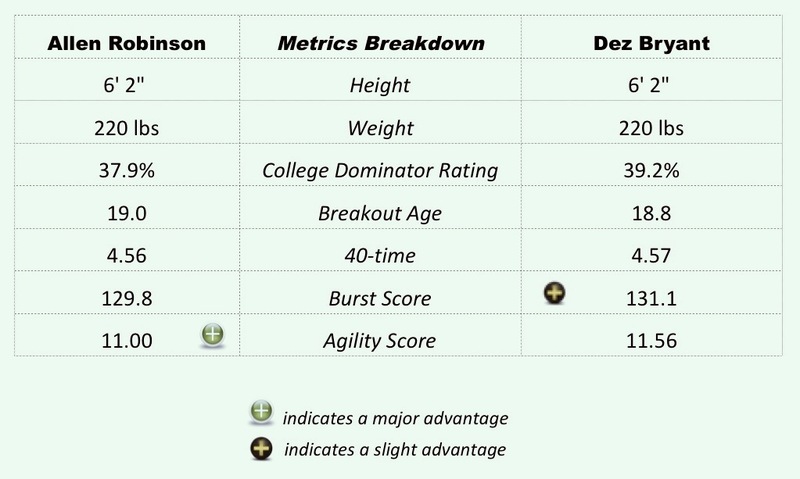 Dez has a bit more verticality to his game, while Robinson possesses better lateral agility, but the similarities are striking. When the metric values separating two players are this close, one is almost certain to remind you of the other on the field of play. Similar playing styles is necessary outcrop of an identical body type, similar production history, and aligned athletic measurements. By cross-referencing less than ten data points, PlayerProfiler was a full year ahead of the major sports media analysts who have recently recognized that Allen Robinson anecdotally “has some Dez Bryant to his game.” Ya think? Unfortunately, all close player comps can not be good news. Didn’t we learn this lesson last year? Both Cordarrelle Patterson and Justin Hunter are exceptional athletes who flashed big play ability working as sub-package receivers despite never producing at the college level (Hunter College Dominator Rating: 27.2-percent, Patterson College Dominator Rating: 17.4-percent). Though a lack of productivity at the college level is most significant possible red flag on an NFL prospect profile, fantasy gamers took the blue pill in 2014. They happily extrapolated Hunter and Patterson’s 2013 statistics one-for-one assuming a full snap share, ignored their lackluster college resumes, and pushed the two players into the third and sixth rounds respectively in many numerous leagues. Given the sting from this false exuberance is still seared into the collective fantasy conscious, it would seem to be impossible to step in the same mud puddle pursuing the athletically tantalizing Martavis Bryant siren song in 2015, right? Wrong. It’s Justin! Justin Hunter! Bing! Watch out when extrapolating a 48-target first season! It’s a doozy, hehe! 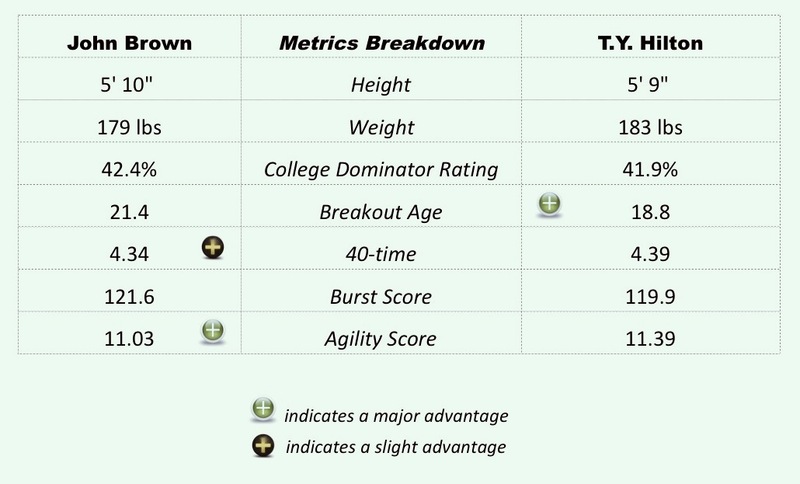 Reviewing the two profiles, only one metric are the two players virtually identical: Burst Score. Outside of Target Premium, which compares Adams’ per target production to other Green Bay receivers, scoring this low on all meaningful efficiency metrics despite having the best quarterback of all time throwing the ball reveled a Jermaine Kearsian inability to translate prodigious college efficiency to the NFL. Adams and Kearse were engines of productivity at the college level, but do not have the size or speed to challenge defense on the outside — unless a deep ball is kicked in the air seven times while the receiver lays on his back — Davante Adams should have no problem securing those particular targets. The John Brown–T.Y. Hilton player comp has become sooo mainstream at this point. You cannot watch an Arizona Cardinals telecast without the sportscaster mentioning how much John Brown reminds them of T.Y. Hilton who also happens to play the same stretch-X wide receiver role in Bruce Arians’ offense. In this case, the anecdotal eye test is not the lie test. The mainstream narrative and advanced metrics data tell the same story. T.Y. Hilton and John Brown were both extraordinarily dominant at small colleges (Pittsburg State and Florida A&M respectively) despite diminutive stature. The metrics breakdown illustrates that Brown and Hilton win with pure speed while possessing less lateral agility than is typically assumed. A year ago, the popular comparable player for Sammy Watkins was Julio Jones. Never mind that Julio Jones is 2 inches taller. Nevermind that Julio Jones weighs 220-pounds. Nevermind that Julio Jones’ Height-adjusted Speed Score (HaSS) is 121.7 to Sammy Watkins’ 109.6. Details. 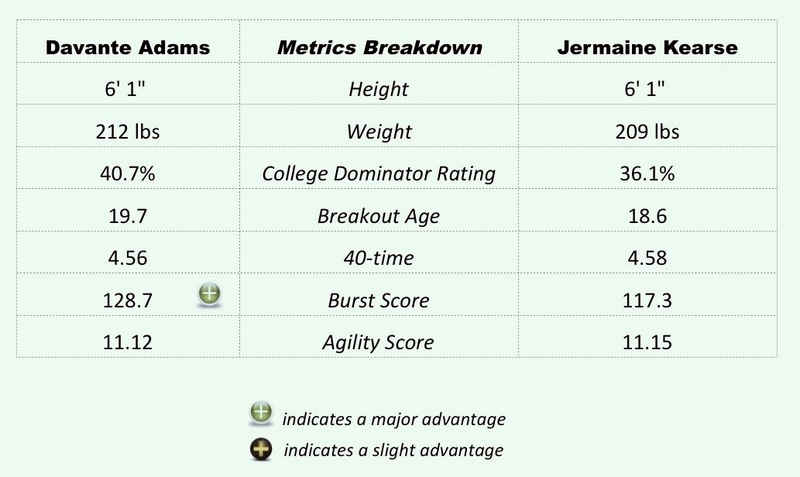 Sammy Watkins looks as explosive as Julio Jones, therefore, the two players must be comparable. Except Julio Jones’ posted a 133.0 Burst Score to Sammy Watkins 120.8 Burst Score. But, but… Sammy Watkins had dreadlocks in college, and Julio Jones had dreadlocks in college. They must be comparable, right? No. No. No. No. No. The beauty of PlayerProfiler’s matching algorithm is that it doesn’t care what the tape watchers who make it up as they go along think. The data tells the story, and the data tells us that Sammy Watkins is strikingly similar to a very good NFL wide receiver, Pierre Garçon. Pierre Garçon and Sammy Watkins are two sturdy playmakers who play bigger than their average height would suggest and excel after the catch. The Garcon comp is no pejorative. It is reality — devoid of collegiate mythology, devoid of narrative, devoid of wishful thinking.